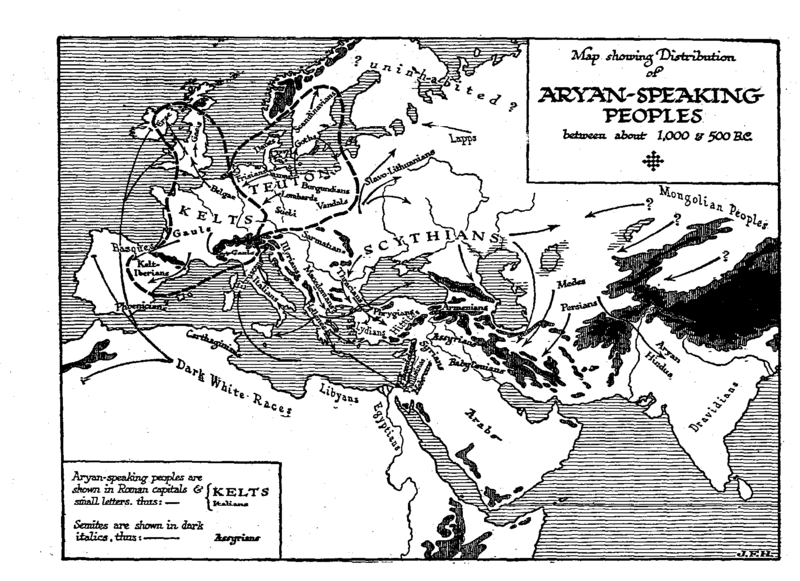 Figure 237: Map — Aryan-speaking Peoples 1000-500 B.C. We have spoken of the Aryan language as probably arising in the region of the Danube and South Russia and spreading from that region of origin. We say “probably”, because it is by no means certainly proved that that was the centre; there have been vast discussions upon this point and wide divergences of opinion. We give the prevalent view. It was originally the language of a group of peoples of the Nordic race. As it spread widely, Aryan began to differentiate into a number of subordinate languages. To the west and south it encountered the Basque language, which was then widely spread in Spain, and also possibly various other Mediterranean languages. Before the spreading of the Aryans from their lands of origin southward and westward, the Iberian race was distributed over Great Britain, Ireland, France, Spain, north Africa, south Italy, and, in a more civilized state, Greece and Asia Minor. It was closely related to the Egyptian. To judge by its European vestiges it was a rather small human type, generally with an oval face and a long head. It buried its chiefs and important people in megalithic chambers — i.e. made of big stones-covered over by great mounds of earth; and these mounds of earth, being much longer than they are broad, are spoken of as the long barrows. These people sheltered at times in eaves, and also buried some of their dead therein; and from the traces of charred, broken, and cut human bones, including the bones of children, it is inferred that they were cannibals. These short dark Iberian tribes (and the Basques also if they were a different race) were thrust back westward, and conquered and enslaved by slowly advancing waves of the taller and fairer Aryan-speaking people, coming southward and westward through Central Europe, who are spoken of as the Kelts. Only the Basque resisted the conquering Aryan speech. Gradually these Keltic-speakers made their way to the Atlantic, and all that now remains of the Iberians is mixed into the Keltic population. How far the Keltic invasion affected the Irish population is a matter of debate at the present time; in that island the Kelts may have been a mere caste of conquerors who imposed their language on a larger subject population. It is even doubtful if the north of England is more Aryan than pre-Keltic in blood. There is a sort of short dark Welshman, and certain types of Irishmen, who are Iberians by race. The modern Portuguese are also largely of Iberian blood. The Kelts spoke a language, Keltic, which was also in its turn to differentiate into the language of Gaul, Welsh, Breton, Scotch and Irish Gaelic, and other tongues. They buried the ashes of their chiefs and important people in round barrows. While these Nordic Kelts were spreading westward, other Nordic Aryan peoples were pressing down upon the dark white Mediterranean race in the Italian and Greek peninsulas, and developing the Latin and Greek groups of tongues. Certain other Aryan tribes were drifting towards the Baltic and across into Scandinavia, speaking varieties of the Aryan which became ancient Norse-the parent of Swedish, Danish, Norwegian, and Icelandic — Gothic, and Low and High German. While the primitive Aryan speech was thus spreading and breaking up into daughter languages to the west, it was also spreading and breaking up to the east. North of the Carpathians and the Black Sea, Aryan-speaking tribes were increasing and spreading and using a distinctive dialect called Slavonian, from which came Russian, Serbian, Polish, Bulgarian, and other tongues; other variations of Aryan distributed over Asia Minor and Persia were also being individualized as Armenian and Indo-Iranian, the parent of Sanskrit and Persian. In this book we have used the word Aryan for all this family of languages, but the term Indo-European is some times used for the entire family, and “Aryan” itself restricted, in a narrower sense to the Indo- Iranian speech. This Indo-Iranian speech was destined to split later into a number of languages, including Persian and Sanskrit, the latter being the language of certain tribes of fair-complexioned Aryan speakers who pushed eastward, into India somewhere between 3,000 and 1,000 B.C. and conquered dark Dravidian peoples who were then in possession of that land. From their original range of wandering, other Aryan tribes spread to the north as well as to the south of the Black Sea, and ultimately, as these seas shrank and made way for them, to the north and east of the Caspian, and so began to come into conflict with and mix also with Mongolian peoples of the Ural-Altaic linguistic group the horse-keeping people of the grassy steppes of Central Asia. From these Mongolian races the Aryans seem to have acquired the use of the horse for riding and warfare. There were three or four prehistoric varieties or sub-species of horse in Europe and Asia, but it was the steppe or semi-desert lands that first gave horses of a build adapted to other than food uses. All these peoples, it must be understood; shifted their ground rapidly, a succession of bad seasons might drive them many hundreds of miles, and it is only in a very rough and provisional manner that their “beats” can now be indicated. Every summer they went north, every winter they swung south again. This annual swing covered sometimes hundreds of miles. On our maps, for the sake of simplicity, we represent the shifting of nomadic peoples by a straight line; but really they moved in annual swings, as the broom of a servant who is sweeping out a passage swishes from side to side as she advances. Spreading round the north of the Black Sea, and probably to the north of the Caspian, from the range of the original Teutonic tribes of Central and Northcentral Europe to the Iranian peoples who became the Medes and Persians and (Aryan) Hindus, were the grazing lands of a confusion of tribes, about whom it is truer to be vague than precise, such as the Cimmerians, the Sarmatians, and those Scythians who, together with the Medes and Persians, came into effective contact with the Assyrian Empire by 1,000 B.C. or earlier. East and south of the Black Sea, between, the Danube and the Medes and Persians, and to the north of the Semitic and Mediterranean peoples of the sea-coasts and peninsulas, ranged another series of equally ill-defined Aryan tribes, moving easily from place to place and intermixing freely-to the great confusion of historians. They seem, for instance, to have broken up and assimilated the Hittite civilization, which was probably pro-Aryan in its origin. These latter Aryans were, perhaps, not so far advanced along the nomadic line as the Scythians of the great plains. “The Keltic group of languages, of which it has been said that they combined an Aryan vocabulary with a Berber (or Iberian) grammar.” —Sir Harry Johnston. Roger Pocock’s Horses is a good and readable book on these questions.